We are available to help with arranging emergency care for any Italian Greyhound in need. Examples of where emergency care may be required include when the owner has become incapacitated due to sudden ill health, the death of an owner, or an Italian Greyhound that is suffering from neglect or abuse. We do not provide a boarding kennel service for people going on holiday! Any Italian Greyhound coming to us for emergency care will be assessed and placed with one of our approved foster carers, all of whom have experience of living with and caring for Italian Greyhounds, and have passed our home checks and assessments. A note to all Italian Greyhound owners: regardless of your age and health, have you thought about what would happen to your Italian Greyhound if you were suddenly incapacitated or passed away while your dog was still reliant on you to care for him/her? Is there a member of your family who is able and willing to care for your dog for life? A friend? The original breeder? If not, you can plan ahead and arrange for your dog to come into our care should the need arise. 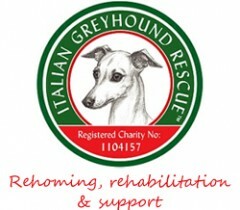 Simply complete the form below (PDF) and send a copy to the Italian Greyhound Rescue Charity. You should also inform your family and friends of the arrangement so that they know who to contact in an emergency.